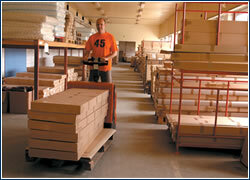 In fourteen years the furniture company Gazel has built an outstanding reputation and gained loyal customers. 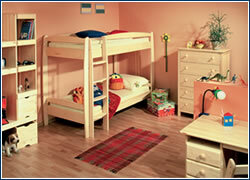 Its flagship wares are students’ and children’s furniture made of solid spruce. 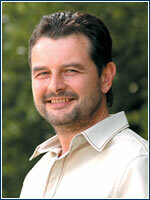 BEFORE THE REVOLUTIONARY year of 1989, Jiří Gabriel, Gazel’s founder and director, worked as an operations manager at the JZD Slušovice construction plant. “I never even dreamed of making furniture some day,” says this architect, who after the revolution switched between several business activities in order to finally find a home in a field that is far removed from construction. 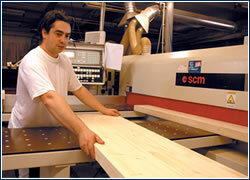 “My wife and I had young children and we wanted some nice furniture for them made out of natural wood. But there was nothing in the stores that I liked, so I started designing furniture in my head,” he adds. He was soon successful, and today Gabriel has 250 certified spruce products that are inspir-ed by today’s northern trends to his credit. Gazel filled a niche in the market and now has sales of CZK 120 million a year, with 30% of its production exported and many imitators, both here and abroad. Although it seems nearly impossible today, at the beginning of the nineties Czech shops offered mainly tasteless unit furniture made of laminates, with a minimum of wood in the form of veneer. Somber, dark mahogany was the height of elegance. The wooden northern style furniture that is now so popular simply didn’t exist here, and conservative Czech customers didn’t ask for it. Gabriel wanted to treat his daughters with something more cheerful and practical, so he and his wife founded a limited-liability company with basic capital of CZK 100,000, and they started manufacturing and selling students’ and children’s furniture made of solid spruce. If the niche in this market segment was a black hole, then a lack of customer trust was an abyss. “No one wanted to buy it!” laughs Gabriel. “People didn’t understand how a few pieces of ordinary wood could cost as much as the smooth laminates and similar atrocities they’d become accustomed to over the decades,” he adds. When they opened their first shop in Zlín in 1993, Gabriel says he spent every Saturday there and relentlessly sold the merits or their furniture to customers. “It’s simple, functional, variable, and ecological. With our commode you’re bringing home a piece of nature that will never be out-dated,” he explains convincingly. Educating customers was hard work, but Gabriel needed energy elsewhere, as well. He launched the firm with his wife, who owns a 50% stake, and three colleagues. “Everyone did everything,” he recalls. “We acquired our materials, we oversaw production, loaded and unloaded goods, monitored our cash flow. We were terrified of bankruptcy, as customers paid their bills late or not at all.” They prevented this outcome by not taking out any loans and having their customers pay cash on delivery. Even later Gabriel never took out a loan, and he invested his profits in buying materials, machinery, and advertising. “We spent all our free resources on advertising in print media – especially in lifestyle magazines,” he says. Gabriel adds in jest that in order to motivate his colleagues he promised that when the firm reached a million in sales he’d buy a keg of beer and a pig to roast and throw a party at his house. ” It was a big challenge. When a few customers started showing off their new commodes or cabinets to their friends and the advertising kicked in the avalanche was on.” Annual sales of CZK 4 million in 1993 rose to CZK 12 million in 1994 and grew ten-fold in 1995 to CZK 120 million crowns. “Now we’d have to be constantly roasting pigs in our garden,” chuckles Gabriel, who abandoned this nice custom but still enjoys very close ties to his colleagues, whom he doesn’t call employees on principle. The original three colleagues who started with him in 1991 were soon joined by 20 distribution center workers in Slušovice and a hundred cabinet makers who manufacture furniture in four plants – in Bánov, Otrokovice, Držková, and Zlín. Gazel owns a small stake in these plants, which the owner wants to increase gradually, although in the future he wants to focus mainly on sales. “In my opinion, engaging solely in manufacturing and neglecting sales is the route to hell,” Gabriel says decisively. His priority is building another distribution center in central Bohemia to accelerate distribution and make it more efficient. Gazel has a dense network of contractual vendors – besides two company outlets, in Zlín and Prague, it supplies over 200 shops throughout the Czech Republic. Gabriel prefers selling in brand-name furniture stores, which guarantees a professional approach to customers. “We also tried the larger retail chains, but then we got out, since they sell products we don’t consider high-quality, and we didn’t want to harm the good name of a well established brand,” he explains. Although they haven’t conducted any market research, Gabriel estimates that Gazel has a market share of about one-third in the children’s and students’ spruce furniture. Because the Czech market is stagnating somewhat, the firm is concentrating more and more on exports, which now account for over 30% of production. It exports to Slovakia, Hungary, Croatia, Ukraine, Germany, the US, and Slovenia, a country that is known for its furniture. The director sees further opportunity for growth in increasing exports and enriching its assortment of products with furniture made of harder woods. “We go to trade fairs and exhibitions. 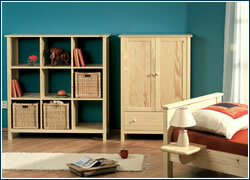 We have recently made several new products out of beech, and they are much in demand. If everything goes well, in ten years Gazel could reach annual sales of CZK 500 million. Maybe even sooner!” exclaims Gabriel optimistically. WE BET ON our customers returning,” says Gazel’s director Jiří Gabriel, summarizing his marketing strategy. How do you get customers to come back? A new variable collection hits the market each year. The products are aesthetically pleasing, very durable, and easy to maintain. Thanks to sufficient warehouse space and manufacturing flexibility, the firm is able to satisfy customers immediately, which is a big plus when compared to waiting times at other furniture vendors. Reasonable prices help, too. 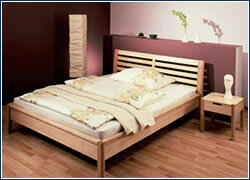 A bed sells for as little as CZK 2,400, a commode from CZK 1,500 to 5,500, and a wardrobe sells for about CZK 8,000. 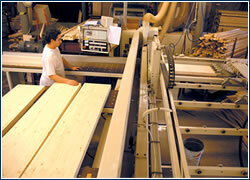 “We try to meet demand as fully as possible, with customized production and consulting. Our motto is: Everything for the customer,” says Gabriel. NEARLY ALL GAZEL products originated in the mind, or through the pen, of its founding father. “I’m guided by instinct and the belief that what my family likes others will like too. I put my heart into it,” Gabriel says. Because he has a personal relationship to production, it bothers him when he occasionally encounters poor imitations. Unlike Gazel products, which are certified by the Light Industry Testing Institute, imitations appear to be of high quality only at first glance. Not infrequently they also carry the firm’s name. “In one large retail chain I discovered a commode called Gazel no. 5, but it wasn’t made by us. Someone simply abused our brand,” Gabriel says. The firm took the case to court, but even after seven years nothing has been accomplished. “We gave up,” the director admits. “But you can find imitations on a daily basis!” he adds angrily.